The retro dining room looks like it could have come out of the 70s, decorated in Halloween colors of bright orange, black and white with stainless tables and hanging pendant lights. Huge black and white graphics line the walls. We are always hesitant to eat inside a hotel but when we arrive in a new city after a day of traveling, it sometimes seems like the path of least resistance. In this case, it turned out to be a pleasant surprise. The 40-seat Silk Brasserie has been a fixture on the ground floor of the five-star Hotel Sofitel Lyon Bellecour (France) since it opened in 1969. However, award-winning Parisian designer Patrick Norguet transformed this informal restaurant in 2008 to give it the contemporary feel and look it has today—with the only remaining design element of the past probably being the rich hardwood floors. The menu offers a variety of reasonably priced options divided into appetizers, risottos, pates, fish, meats, cheeses and desserts. Less adventuresome guests can even order a burger or club sandwich. Since we arrived late we ordered one appetizer and one main course to share. Our charming waitress, Samantha, was fluent in English and very efficient and accommodating. A native of Brazil, she had come to Lyon to work and study. The city is a mecca for young people hoping to learn about cooking and the restaurant industry. She explained that her parents used to like American TV so they named her after Samantha, the witch. The kitchen was kind enough to split our orders onto two plates. For an appetizer, we ordered foie gras de canard that came with apricot chutney. We were going to order a salad as a second course but succumbed to temptation when Samantha explained that it was the last day that the chef would be serving seared veal liver, one of our favorite dishes. (The restaurant menu changes each week with different themes.) It was perfectly prepared, served with onions in a brown gravy and potato gratin. When we saw a Pot Lyonnaise of rose wine from Provence on the wine list, we asked Samantha for an English translation. She explained that typically many casual restaurants in Lyon–bouchons, bistros or brasseries–serve half-bottles of local wine called a pot, similar to the half-carafes we know in the States. It turned out to be a perfect choice for us. For dessert, we ordered a sinfully rich but delicious Tiramisu. The term bistronomie is often used to describe the food at Silk Brasserie, the word a portmanteau (combination) of bistro and gastronomy. This type of cooking uses the same techniques, skills and ingredients that define gourmet cuisine but in ways that are far more informal, more inventive and less expensive. Comfortably lingering over coffee and dessert, we began speaking to a friendly Lyonnaise couple who were dining nearby. Laur and Jacques mentioned that they worked in the area and came here frequently for food that was fresh, dependable and reasonably priced. They offered suggestions for other restaurants we might try during our stay in Lyon as well. Brasserie Silk passed our taste test but learning that the restaurant is frequented by locals and not just travelers staying at the hotel confirmed our impressions that we had made a good choice. 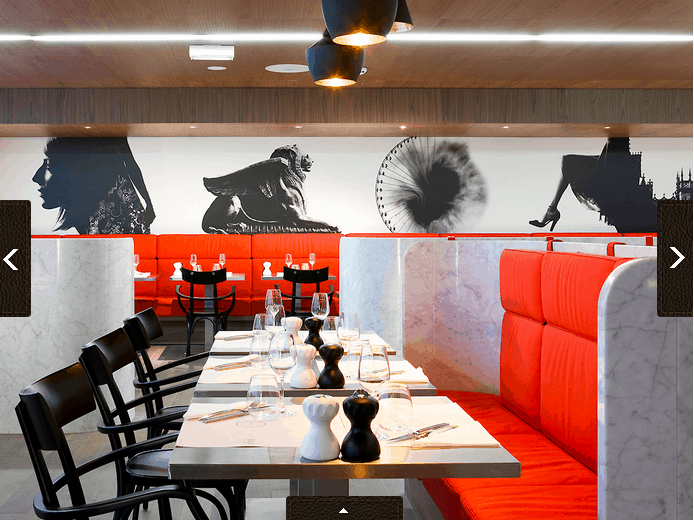 Le Silk Brasserie – accessible through the hotel lobby and centrally located close to the Place Bellecour. The brasserie is open 7 days a week but like many other restaurants in Lyon, you need to dine during rather narrow time windows. Lunch is served between noon and 2:30PM; dinner between 7 and 9:30PM. During the summer, there is an outdoor terrace service. The Hotel Sofitel Lyon Bellecour also houses a an award-winning gourmet restaurant, Les Trois Domes. Chef Christian Lherm oversees both restaurants at the hotel. The Fork is a helpful restaurant website for visitors to Lyon (it also has listings in major cities across Europe). Not only can you make reservations but the site also advertises discounts and offers. This post is part of a LinkUp with Noel Morato’s Travel Photo Discovery. Hi Irene: I’ve found that hotel restos are getting increasingly better. Some of the finest meals I’ve had while travelling have been located in hotels, inns, and resorts. I think they had to up their ante as the old days about “Holiday Inn food” encouraged the hotel industry to raise the bar (no pun intended) and now, even Holiday Inns are providing some darn good meals. So true! We always have this misconception that hotel dining rooms won’t be as authentic or good as local bistros or restaurants. (And they’ll be more expensive.) And then sometimes we’re pleasantly surprised that this just isn’t the case. Here on Lombok and Bali in Indonesia, we’re finding that many of the boutique hotel restaurants are better than in town (and just as wallet-friendly). For hotel restaurants to survive, not only do they need to offer competition that will attract tourists but also locals. That apricot chutney looks amazing! Thanks for the tip on Lyonresto.com – the last time I was in Lyon I arrived late at night without a reservation so ended up eating at a disappointing spot and paying a fortune. 19 euros for lunch at Le Silk Brasserie would have been a great alternative. I thought the title was the silk brassiere at first glance and I thought, how daring and retro. Turns out- it is a bit retro. Love foie gras, but have only had goose. As duck liver is delish, I’m sure I would have loved that. These days, there are a lot of good hotel restaurants. Santa Fe has a bunch of them and we’ve been pleased with ones we’ve encountered in our travels, though some certainly are ho-hum. How great to stumble upon a restaurant upon your arrival that wasn’t overpriced, serves tasty and beautifully presented food and is favored by the locals. Sounds like you had the added bonus of some pleasant conversation as well as future tips about more terrific places to dine! How fortunate to come across such a good restaurant when you weren’t expecting it. The food looks delicious. I too am sometimes leery about hotel restaurants, but like some others have already mentioned, times are changing. The lucky finds are the most memorable events and you really lucked out on this hotel. Although we were fortunate when dining in this area for reasonable priced meals. This was perhaps because we had our six month old grandson in our group. Gorgeous babies always bring out the best anywhere. I know what you mean about dining in a hotel dining room, we usually feel as if we should go out and explore – not sure why – as some hotels actually do offer fine dining/service. And I think you’re correct in that hotels need to offer full service/amenities to keep guests in the house. I’ve never been to Lyon, but hopefully I will get there one day. The tiramisu looks fabulous. I’m strict a vegetarian so I’m always limited at restaurants. I think the important question is: Did you wear a silk brasserie to dine at this restaurant? It sounds to me as if they have a dress code! I went to Lyon when I was 17 and went with my French Club group. I thought everything they fed me was appalling because I grew up in a steel town in western Pennsylvania! I’d love to take my Big Girl palette back and give Lyon another try! It’s hard to go too wrong with a Sofitel or a Fairmont – I think they both have good food for the most part. That site you mentioned for booking ahead sounds like a great bargain. Thanks! What a delicious treat! I love chic decor, even when it is over the top. It makes me think that they are trying to entertain us as well as feed us delicious food. I agree with everyone else, for the most part hotels offer extraordinary restaurants. They do feel the need to compete and I believe they are doing a great job. I am off to France in the Fall,but not to Lyon, I will live vicariously! Hi Irene-I agree with Doreen, and I see most of the others. I also think hotels are really putting the effort into upgrading their meals and many of my favorite meals in Boston are coming out of hotel restaurants. Guests are learning more and more about food and i’m glad they are listening to the travelers who are adding good meals as a part of their itinerary.